That is one killer ship. So she levitates her ship? And goes to town on the Empire? I like her even more. @giovanni - That seems to be the case; she couldn't do crap before the case was removed. Whatever floats her boat, I guess. Ironing out the details, I see. Meh, true pirates should fly in sail ships. The metal one doesn't have a mast, which makes me think she isn't a pirate. She's probably a politician, journalist or a lawyer, secretly, and the pirate thing is just a cover. Or she doesn't use sails because that way the ship cant move without her and her crew remains absolutely loyal to her. are you going to go into more detail later about the deal between mages and the ocean? Does salt water nullify magic? Wait, does he mean the ocean is a weakness as in it's always a strategic weakness to lone players, or are you invoking the idea of running water weakening magic? Nah it's simpler than that; Most mages still rely on boats to cross the ocean; blow up the show & the mage will drown just like any other person. Like make a list of powers that would allow you to safely cross an entire ocean without severely increased risk of harm. (while simultaneously keeping access to the required food and water to survive) there's a few, but it's not a big list. 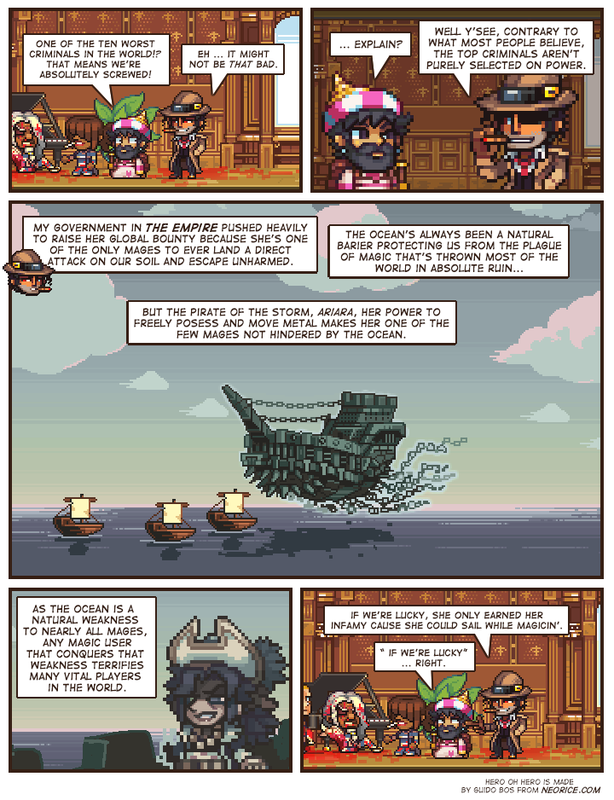 Ariara's power is arguably strongest on the ocean because it allows her to control a ship significantly more dangerous than the average one, while the number of other magic users at sea is significantly lower than on land. That ship is huge! No wonder she was able to toss the general around so easily.. He probably feels like an empty soda can in comparison.